The Australian gems have lightened up the international youth basketball scene for the last couple of seasons with visits to France. Last season in the final, the gems lost to France. This year they have already qualified for the final. Kerryn Harrington (pictured) and Jillian Haughton were members of last season's squad. Unfortunately some of the players went down with a bug just before the tournament. However this did not stop them from playing their fast game against Belgium. Australia led by as many as 22 points with five minutes to play (55-33) and looked safe. Yet Belgium with Hanne Mestdagh went on a late surge to give the Australians a little scare. Australia weathered the storm and won (59-46). Ashleigh Stonehouse was the top scorer for the gems with 18 points. In their second game Australia struggled for 35 minutes against Sweden and trailed (42-47) with five minutes to play. But Phil Brown, the Australian coach, found the right words for his players and with Nicole Seekamp (23 points and 10 rebounds) having fun offensively, Australia went in front for the first time with 40 seconds left to play. Australia ended up winning (56-51), a result that secured their place in the final. Belgium made up for their disappointment from day one with a hard fought victory (65-64) against the Czech Republic. Lien Delmulle was the match winner with 22 points. Turkey came to this tournament with their U17 team and defeated France (53-38) on the opening day. The Turkish team then, full of confidence, beat Russia (55-51) in good defensive performance. The Russian played much better collectively than their opponents but were not aggressive enough in attack. With this victory Turkey play in the final. For France the competition did not start well with a defeat against Turkey. They picked themselves up to get past the Netherlands (73-61). France huffed and puffed their way through the first half and went into the interval trailing (30-31). However during the third quarter, France stepped up defensively and started to take control of the game. 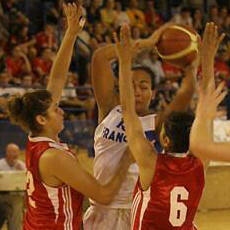 Martine Barba was the French catalyst as they went into the final quarter leading (50-45) . The Netherlands' lack of experience playing against Division A nations started to show as they let France off the hook and fell further behind during the last 10 minutes. 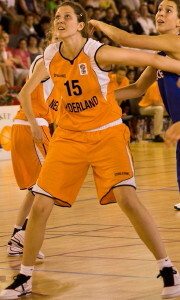 Zara Butters, the point guard, was absent for the Netherlands, but Marlou de Klijn and Eline Kraaijenoord with 19 and 14 points gave a good showing.